Not many men get to live their dream and be successful doing it. At a very young age, Shawn Flarida decided he wanted to work with horses for a living. As Mr. Flarida puts it on his own website, "all I wanted to do was train horses, for as long as I can remember." Before he was even in high school, the young Flarida had already managed to earn his first prize paycheck from the NRHA's (National Reining Horse Association) Limited Non Pro Division competition in Old Washington, Ohio. After graduating high school in 1988, Flarida went on to work for his older brother for half a year before moving on to lease his own barn in Miamisburg, Ohio. 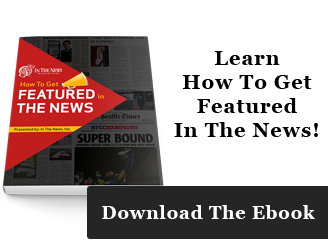 The enterprising Flarida overcame adversity in his early career through his indomitable spirit and determination, saying that despite only having eight clients in the beginning, he "never doubted it was what [he] was meant to do." The young Mr. Flarida had a dream of working with horses for a living, and he was determined to follow that dream until it came true. Flarida's faith in himself was quickly rewarded, as he had not one, but two horses in the NRHA Open Futurity finals in 1990. In the following year, Flarida won the NRHA Derby Limited Open Reserve Championship, and had two horses place fourth and eighth in that year's Limited Open Futurity. Since those early years, Mr. Flarida has earned dozens of trophies in Reining competitions. From his humble beginnings in that leased Miamisburg barn, Flarida has grown to become one of the most recognizable and successful horse reining trainers in America. 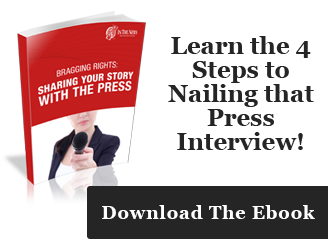 He has co-authored respected books of horse-training advice such as Western Horseman's "World Class Reining" and has a series of advice videos for equestrian enthusiasts and aspiring horse trainers available online. 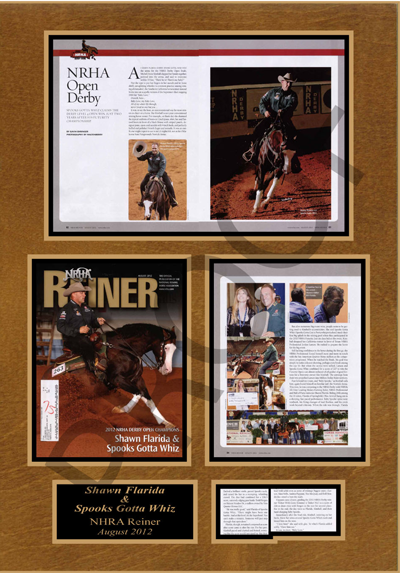 Flarida is regularly featured in publications such as Quarter Horse News and HorseChannel.com for his many successes in the field of horse reining. 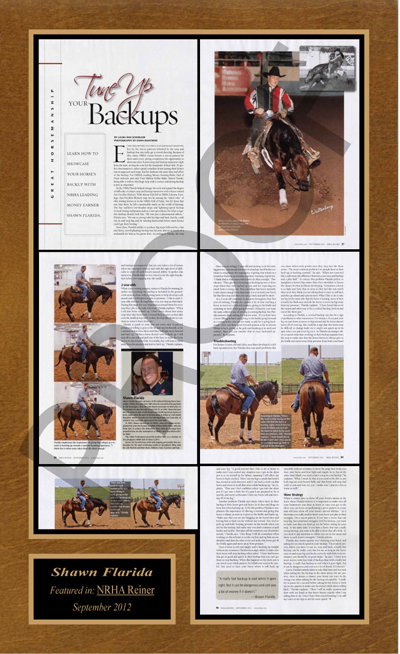 Flarida's third consecutive Kentucky Reining Cup win was covered by HorseChannel.com in an April 2013 issue of the online publication. In the article, Flarida is humble in his victory, contributing his win to the fact that he was well rested while his opponents had just finished another strenuous competition. Such humility in victory marks Mr. Flarida as a top-quality sportsman and this story shows the true value of his character. Beyond his accomplishments as a breeder, trainer, and rider of horses, Shawn Flarida is a family man. He married his high school sweetheart in 1992 and the couple has three children. Flarida keeps his roots in his home state of Ohio, establishing a home for his family in Springfield, Ohio. Flarida maintains close ties with his own parents, as his mother and father often accompany the rest of his family to shows and competitions. The Flarida family is an active bunch, and the children pursue their own goals as vigorously as their father, whether those goals be in sports or academia. Over the years, Mr. Flarida has made the news numerous times, and he has chosen to commemorate his long, storied history of success with In The News plaques. 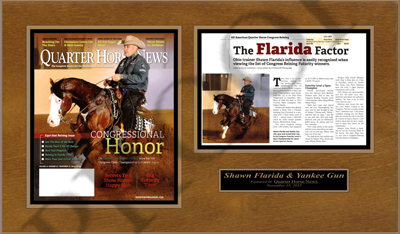 Many of his appearances in magazines such as Quarter Horse News and NRHA Reiner have been preserved in plaque form to help inspire his family. Every day, these plaques prove that a man can not only pursue his dreams, but be able to thrive while doing so. 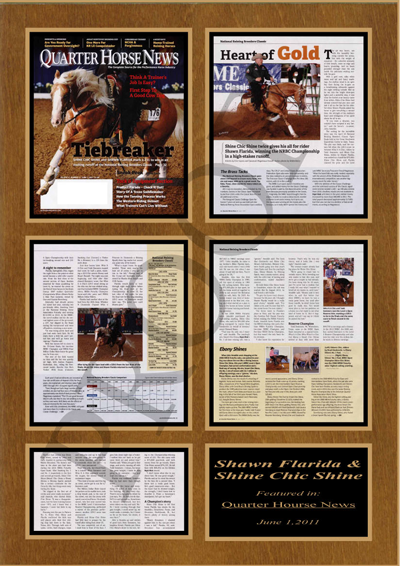 Mr. Flarida has over fifty unique plaques to help him share his story with friends, family, and business partners to stand as proof of his talent, devotion, and enthusiasm for the sport of Reining. New acquaintances and old friends alike can appreciate Mr. Flarida's story from the beginning as told in his In The News plaques for years to come. 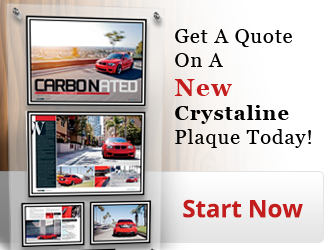 Each plaque is custom-crafted to Mr. Flarida's personal specifications and will preserve the articles of his success for decades. This means that Flarida's family will have a lasting keepsake to remind them of his rise to horse reining superstardom. Flarda's children, and eventually their children, will be able to gaze at these heirlooms and know Shawn Flarida for his integrity, sportsmanship, and dedication to his dreams and look back with pride that they are related to this great man. These reminders of Flarida's passion for the sport of reining and his unyielding dedication to the mastery of his chosen path in life will serve as a lasting testimony to the power of believing in oneself enough to find one's dreams. It is with the greatest pleasure that In The News has helped Mr. Flarida preserve his story for posterity. It is our hope that he will continue to enjoy success and plenty in his endeavors for years to come.